Golden aster can cover entire valleys with its bright yellow flowers. It blooms June through October. A coarse, upright, much-branched perennial that can cover entire valleys. Flowerheads bright yellow, to 1½ inches wide, bracts often purple-tipped. Ray flower corollas about 1/2 to 3/8 inch long. Blooms June–October. Leaves hairy (as are the stems), alternate, sessile, often with a few fine, sharp teeth, to 3 inches long, elliptical to lanceolate, with pointed tips. Similar species: Of the 2 other Heterotheca spp. 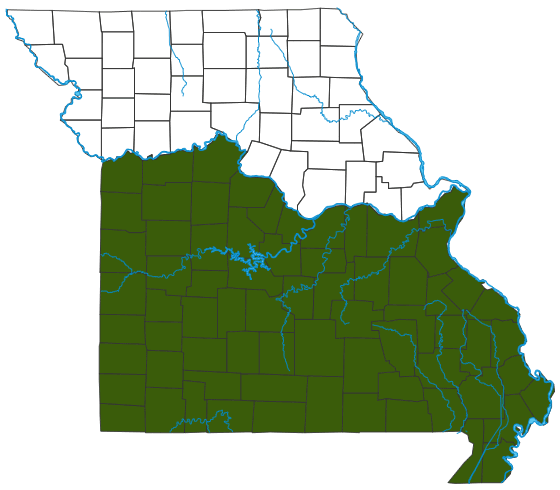 in Missouri, only camphorweed, or telegraph plant (H. subaxillaris), is likely to be encountered. It’s mostly in the Bootheel and along the Missouri and Mississippi rivers; the corollas of its ray flowers are shorter, about 1/4 to 3/8 inch long. Soft goldenaster (Bradburia pilosa) is closely related. It is annual, rarely more than 2 feet tall, has flowerheads less than 1 inch wide, and is found in the southern third of Missouri. Sand prairies, glades, ledges and tops of bluffs, openings of dry upland forests, banks of streams and rivers, bottomland forests, and swamps; also pastures, old fields, fallow fields, levees, railroads, roadsides, and open disturbed areas, often in sandy soils. Scattered mostly south of the Missouri River. Golden aster tolerates drought and is a good native plant for midsized borders and native, prairie, or naturalized areas. Also sometimes called lemon yellow false goldenaster. A variety of bees, wasps, flies, and butterflies visit the flowers.